The brightness of peppermint and spearmint softened with sweet vanilla. Such a lightly refreshing combination of flavor, perfect for any time of year! Our vegan lip balm glides on smooth and has great staying power. We've taken some of our lip balm to the Austin City Limits festival. It didn’t melt after being out in the hot Texas sun all weekend, so it should hold up well in your pocket too. Enjoy! The purchase of this listing is for one .15 ounce tube of our Vanilla Mint Lip Balm. Received quickly and I've used it a couple times already. I appreciate that it doesn't leave a greasy feeling on my hands and the scent is natural, not perfume-y. Would buy from again. Thanks a bunch! Love love love this lotion bar!!!! It isn’t greasy, it works great and it smells delicious. 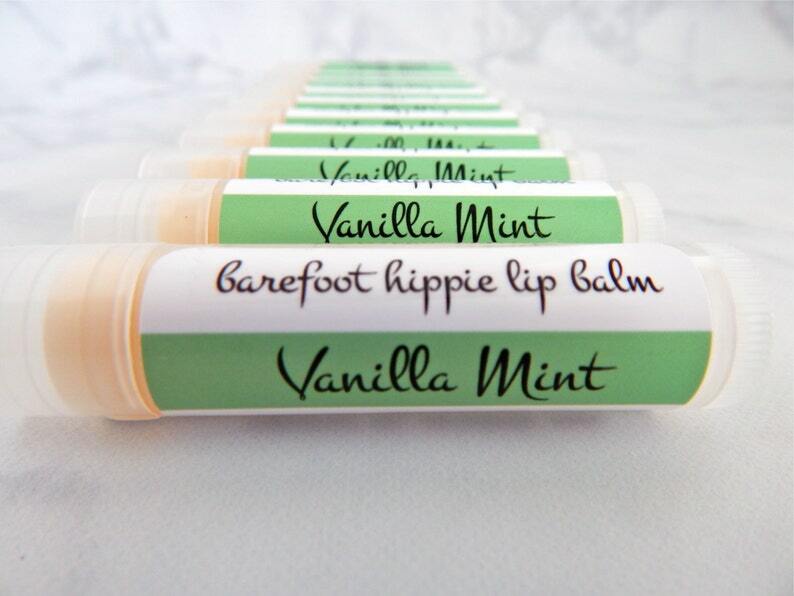 Personalized lip balms are made to order and will be packed and shipped within 1-2 weeks of payment received. Actual delivery times will vary. Customers are responsible for purchasing any shipping insurance and/or international shipping or customs fees. All in-stock items (everything except the personalized lip balms) will ship within 3-5 business days of your purchase. Actual delivery times will vary. Customers are responsible for purchasing any shipping insurance and/or international shipping or customs fees. Due to the personal and hygenic nature of bath and body items, all sales are final. Thank you for understanding. If you have a concern when you receive your order, please contact me. Texas residents must pay 8.25% sales tax, which will be added to your total at checkout. Custom orders and wholesale inquiries are welcome. Feel free to convo me through Etsy or email me at: barefoothippiesoapworks@gmail.com. If the difference between the calculated shipping charge and the actual shipping cost are greater than $1.00, you will be refunded the difference.